Business Development Officer at BB&T Corp. Accomplished business development leader, successful sales professional, and acknowledged top performer with a history of achievement in exceeding revenue goals and bolstering yearly market share for companies in the Financial Services Industry. ·Forward-thinking high-achiever with unwavering determination to achieve on-target results in economic downturns and challenging markets. ·Influential communicator offering superior interpersonal skills to facilitate decision-making, forge trust-based relationships, and respond to customer needs with accurate solutions. ·Analytical and insightful; possesses in-depth knowledge of retirement plans and investments. 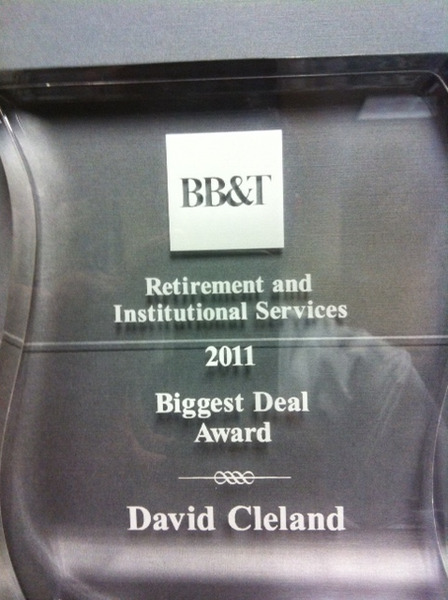 ·Achievements included winning the Team Player of the Year Award in 2005 at Mutual of America and receiving recognition for meeting revenue targets within a year of start date at BB&T. Vice President & New Business Development Officer: Spearhead sales of a wide-range of products, including engaging plan sponsors with $10-$200 million in retirement assets and promoting the company’s investment advisory services. Define effective marketing processes targeting non-bank clients. Interact with decision-makers throughout diverse industries, including Business, Aerospace/Defense, Banking/Financial Services, Healthcare/Medical Services, Real Estate/Property Management, and Government, among others. Provide leadership and direction to dealers, value added resellers (VARs), and field sales professionals. Conduct forecasting and reporting. Deliver executive level presentations and speak at industry and corporate events. Contribute to product development. ·Approached marketing in non-conventional ways, leveraging innovative methods and tools such as email, networking sites, and group meetings with centers of influence. ·Facilitated tracking of cold call activity with the creation of a centralized database. Executed 50-75 cold calls to non-bank prospects per week. Specialist in providing pension and retirement-related products, programs, and services. Consultant: Sold from an extensive portfolio of products, including 401(k), Profit-Sharing, Defined Benefit, Defined Contribution, 457,SEP, SIMPLE, ROTH (k), Cross-Tested Plans, IRA, and Roth IRAs for acquisition of assets. Managed 110 plan sponsors relationships. Presented in front of groups, including holding board of directors meetings, meetings for enrollment, ERISA compliance, and investment education. ·Demonstrated versatility by working with a highly diversified client base, from new plan installations to clients with $100 million in assets. ·Delivered exceptional service; supported clients with plan conversions and new implementations. Spearhead sales of a wide-range of products, including engaging plan sponsors with $10-$200 million in retirement assets and promoting the company’s investment advisory services. Define effective marketing processes targeting non-bank clients. Interact with decision-makers throughout diverse industries, including Business, Aerospace/Defense, Banking/Financial Services, Healthcare/Medical Services, Real Estate/Property Management, and Government, among others. Provide leadership and direction to dealers, value added resellers (VARs), and field sales professionals. Conduct forecasting and reporting. Deliver executive level presentations and speak at industry and corporate events. Contribute to product development. Cold calling on prospective clients to build a robust pipeline. Tracking sales and prospecting efforts through ProActiv, SalesForce, and Sage CRM systems.